Click here to be alerted when this floor plan becomes available. Our two bedroom, two bath apartment home features an open central living/dining/kitchen area with a bedroom and bath at each end of the apartment. 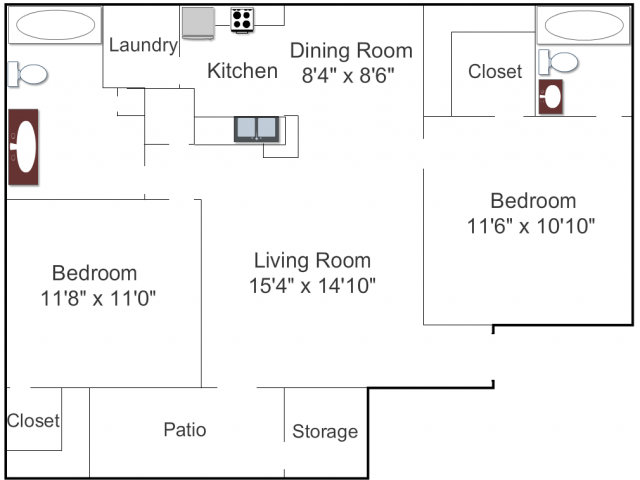 It is a great floorplan for roommates or a family. ** To reserve apartment, deposit must be received within 24 hours of application approval. Up to two pets per apartment are accepted. Pets must be less than 45lbs, fully grown. Pet fees are $300.00 per pet and a monthly $10.00 pet rent per pet. Undocumented pets will be fined $200.00 plus $10.00 per day until removed. Pets are not allowed on carpet that is not three years old or older. Service animals are not considered pets and will be accommodated with approved documentation.